Who found the best fit on deadline day? Kings GM Dan Lombardi likes the idea of being in a playoff race this season, although there's something to be said for reloading when you can obtain a lot of futures to help a rebuilding team. Said Lombardi, "I was kind of looking for everything the last two years. It was almost asset acquisition. Now I'm out there looking for more of a specific thing, which is another indicator when you're building that you're getting better. Because I'm not just looking for anything or any type of asset, I'm looking more towards an M.O. that fits within what I have." Trading Patrick O'Sullivan to Carolina for Justin Williams, a 31-goal scorer for the Hurricanes when he helped them win the Stanley Cup in 2006, may not yield a lot of help to the Kings this season since it has been injury-plagued for Williams, but this could turn into a Hollywood blockbuster for Los Angeles in the future with Williams' experience and goal-scoring savvy. That's the response you no doubt heard in more than a handful of press conferences around the NHL after deals were announced leading up to the March 4 trading deadline. It's hard not to get caught up in the "who-goes-where-for-what" shell game. Big names? Big deals? But that's not always the best way to pay the price to make a team better at the NHL's trading deadline. Mathieu Schneider in Montreal. Ryan Whitney in Anaheim. Chris Kunitz in Pittsburgh. Those were the pre-deadline day acquisitions of note. Then came the names of Olli Jokinen, Erik Cole, Mark Recchi, Bill Guerin and Olaf Kolzig as 22 trades were consummated on deadline day totaling a record 47 players. Lots of fodder for our "perfect fit" bunch. Here's where we take the scenario one step further, adding focus, fire, flexibility and familiarity to the F-factor list to make a trade really work. Flashback to last year for a moment, when we heard "perfect fit" in Pittsburgh when the Penguins acquired gifted scorer Marian Hossa and Pascal Dupuis in a big deal from Atlanta. We heard it in San Jose when the Sharks added offensive defenseman Brian Campbell. It was said in Washington as Russian center Sergei Fedorov was supposed to be the final piece to help fellow comrades Alex Ovechkin and Alexander Semin lead the Capitals to a long run in the playoffs. But the best deal at the deadline came when the Detroit Red Wings obtained defenseman Brad Stuart from the Los Angeles Kings for a second-round pick in 2008 and a fourth-rounder in 2009. All Stuart did was take his minus-16 in Los Angeles with him to Detroit and, after being teamed with Niklas Kronwall, re-energized his career -- going plus-21 in 31 games, including the playoffs, in helping the Red Wings win their fourth Stanley Cup in the last 11 years. At this point, you might say that just trading for Stuart, the No. 3 pick in the 1998 Draft by the Sharks, didn't work the previous February for the Calgary Flames, who lost in the first round of the playoffs. So why was this trade a perfect fit in Detroit? Maybe because the Red Wings took the extra step to make the deal work for both Stuart and the team a win-win situation for both sides. They found the fit. They gave Stuart the focus so he could be more comfortable in his new setting, thereby creating a fire that maybe even Brad wasn't sure he still had after his road had taken him from San Jose to Boston to Calgary and then Detroit. Coach Mike Babcock added the flexibility and familiarity to make this deal, well, perfect. "The Red Wings made the trade work for me," Stuart explained. "Coach Babcock spelled out what he wanted me to do, what he didn't want from Day 1. He told me, 'Keep it simple ... and if you see you can make a play or make a hit go ahead.' "
That proverbial next step is to make sure the player and the coach are on the same wavelength. "I knew Stewie as a kid in Red Deer. Not personally. I watched him progress in Junior at Regina and with the Calgary Hitmen all the way up to his being a very high draft choice by San Jose coming into the NHL with high expectations," Babcock told me a night before this year's deadline. "When we made the trade, I told him you're going to play our No. 4 slot (on defense behind perennial Norris Trophy winner Nicklas Lidstrom, two-time Stanley Cup champion Brian Rafalski and hard-hitting and burgeoning star Kronwall)," Babcock told me. "I told him we wanted him to bang people. I told him we wanted him to add some grit and give us solid minutes in key situations." Babcock added that Stuart wasn't asked to play the power play, be in the top defensive pairing and, simply, do too much. "We believe in creating a role for each player to put them in a position to succeed," Babcock added. So Stuart hacked and whacked and played assertively and he also scored 1 goal and 6 assists in 21 playoff games, including the winning goal in Game 2 against Pittsburgh. And in the end, the Wings got that perfect fit. So how do we look for this year's fit? Most folks would point to Jokinen. But St. Louis Blues coach Andy Murray and Detroit forward Dan Cleary urged me to pick former Phoenix defenseman Derek Morris. There was support for Kunitz and Schneider for what they've already done in their new uniforms. But, to me, the Chicago Blackhawks just got that Brad Stuart-like contributor in shutdown center Samuel Pahlsson from the Anaheim Ducks for depth defenseman James Wisniewski. He’ll fill that spot behind the Jonathan Toews-Patrick Kane-Patrick Sharp (or current Troy Brouwer) line, plus the exceedingly productive Dave Bolland-Marty Havlat-Andrew Ladd line. Kris Versteeg and Sharp couldn't cut it at center behind them. Now coach Joel Quenneville will have Pahlsson to perhaps match up against the likes of Joe Thornton, Pavel Datsyuk or Mats Sundin in the playoffs. Pahlsson won a Stanley Cup with Anaheim in 2007 and also was a member of Team Sweden when it captured an Olympic gold medal at the 2006 Games. "Winning breeds winning," GM Dale Tallon explained. "He has been successful as a defensive, two-way centerman against the top players in the League. He's a strong character guy who can play both ends of the rink and gives us that veteran presence up the middle." Boston GM Peter Chiarelli went the extra step to add without subtracting to the high-flying Bruins, getting two-time Stanley Cup winger Mark Recchi from Tampa Bay and defenseman Steve Montador (with Calgary during their run to the Final in 2004) from Anaheim. "We're in a market where they demand winners," Chiarelli said succinctly to the Super Bowls the Patriots have won, the World Series the Red Sox have won and last year's NBA champion Celtics. In Recchi, the B's are getting a veteran presence to a young and inexperienced Boston dressing room. 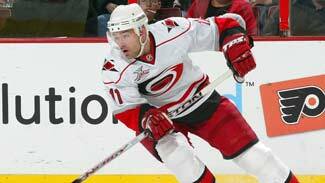 Mark went to Carolina as a rental in 2006 and helped the Hurricanes win a Cup. At 41, he's having a resurgent season (see five-assist game last week) and knows the right words and formula for winning as another Cup in Pittsburgh attest. 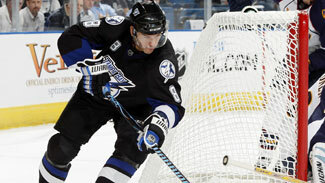 Said Recchi, "I wanted to finish what I set out to prove in Tampa Bay, but ... I play to win championships." Although Pahlsson had only 5 goals and 10 assists in 52 games before being sidelines with mononucleosis that is still keeping him out of the lineup, he gives the Hawks a guy who can win important faceoffs, which they didn't have, and don't forget the offensive contributions he had in the '07 playoffs (3 goals and 9 assists in 21 games) and the fact Anaheim used him successfully on the power play earlier this season when Teemu Selanne was out. Don't kid yourself, he's not a 50-goal guy -- usually scores about 10 a year and erases 40 or more goals by opponents, the kind of guy you need with a young inexperienced playoff team, a guy who packs a punch and is relentless in his ability to check an opponent into submission. "Sammy's a Swede, but he thinks he's from Red Deer," said Toronto GM Brian Burke, formerly the boss in Anaheim. "He's gritty and tough as nails to play against. A definite impact player." "He's strong and smart. Give him an assignment and he's relentlessly passionate about shutting down that player or that line," said Ducks defenseman Scott Niedermayer. Said Ducks coach Randy Carlyle, "We only had one matchup we wanted in the Stanley Cup Final and that was Sammy's line against Jason Spezza, Dany Heatley and Daniel Alfredsson ... and if I'm not mistaken, that shutdown was so productive I think they even outscored the Spezza line." Strong. Smart. Relentless. Impact player. Quenneville, who knows all too well how to spell out Sammy's assignment in Chicago, and, we've already seen in Anaheim that Pahlsson knows how to take that next step. Chemistry 101 -- Everyone's always worried about fitting players into a dressing room and not messing with the chemistry a good team already has. Calgary Flames coach Mike Keenan said getting the right players shouldn't matter. Keenan, using his experience behind the bench with the New York Rangers in 1994, when the team won its first Stanley Cup since 1940, reasoned, "We made five changes at the trade deadline, and we were in a position to win the Presidents' Trophy. Most teams beyond the developmental stage want to take a run at the Stanley Cup." All Calgary did was send a pretty clear message to the Flames locker room that adding center Olli Jokinen (who had his best years in the NHL in Florida with Keenan) and defenseman Jordan Leopold (who formed Calgary's shutdown d-pair with Robyn Regehr in the team's run to the Cup Final in 2004) should be a seamless fit. Added team captain Jarome Iginla: "It does show the belief that we're close, that we have a shot. It's exciting to be in this position when the GM and the ownership group (believe) ... and you're a buyer. That's pretty cool." The key to Jokinen's success in Calgary? He likes to shoot the puck ... and Flames forwards like Iginla, Michael Cammalleri, Daymond Langkow, Todd Bertuzzi, David Moss, Dustin Boyd, Curtis Glencross and Rene Bourque all like to go to the net. Swimming with the Sharks -- San Jose got better, in a big way, with the acquisitions of hard-nosed forward Travis Moen and defenseman Kent Huskins. Moen was key part of the 2007 Stanley Cup-winning Ducks team, scoring the winner in Game 1 of the '07 Final -- and 7 goals in 21 playoff games along the way. Like with Pahlsson, finding the right player at this time of the year involves more than just looking at statistics. Said GM Doug Wilson, "He's got the ability to be physical, skate, penalty kill, play in all situations, be a stopper, play against the other team's best lines. That's a very valuable piece to us." Making a Steelers-type run -- The Pittsburgh Penguins rolled to the Stanley Cup Final a year ago on the shoulders of their strength up the middle -- Sidney Crosby, Evgeni Malkin, Jordan Staal and players those talented centers could make better. Marian Hossa and Pascal Dupuis came over from Atlanta at the deadline and joined with Crosby, while Malkin had Petr Sykora as his sidekick to produce plenty of offense. Leading up to this year's deadline, GM Ray Shero added Chris Kunitz from Anaheim and Bill Guerin from the New York Islanders. One, maybe both, will get the Crosby treatment. Said Guerin, "I'd be thrilled. Who wouldn't be? 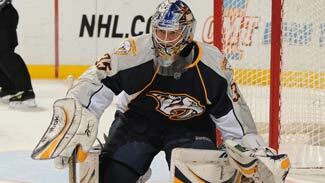 But I'll play anywhere (coach Dan Bylsma) wants to put me." Top six scorers? Pittsburgh now has plenty. In the Nick of time -- Cooler heads prevailed in Minnesota before the deadline. Wild GM Doug Risebrough signed goaltender Nicklas Backstrom to a new four-year, $24 million contract to end speculation his star puckstopper might become a free agent July 1. Reasoned Risebrough, "How can I begin to think I’m going to compete for a playoff spot by trading Backstrom?" Deja vu? -- The Carolina Hurricanes aren't running away with first place in the Southeast like they were in 2006 when they reloaded with Mark Recchi and Doug Weight at the deadline. They are fighting for their playoff lives -- and that's why GM Jim Rutherford looked to Edmonton for a familiar face for a stretch run. "He had great chemistry with Eric Staal, who has been urging us to bring Erik back. Also, it's been our goal to faster and bigger -- and he gives us that. Plus, he still has a home here and we're hoping he plays like he's home." Cole had 30, 29 and 22 goals in his last three seasons before being traded to Edmonton, where he struggled. Ryan's song -- You could say the Anaheim Ducks got an immediate return from their trade of winger Chris Kunitz to Pittsburgh for defenseman Ryan Whitney. And Ducks GM Bob Murray also found out a little more about the character of his new defenseman. Whitney was already in Boston where the Ducks were to play the Bruins in their first game after acquiring the defenseman. Ryan was there to be with his mother, Sue, who underwent successful brain surgery. He played 24 minutes, 19 seconds in his first game with the Ducks, blocking three shots. Murray, on adding to a defense that already includes Scott Niedermayer and Chris Pronger: "I'm a big believer in building from the back end, and our back end wasn’t good enough (referring to an injury in which the Ducks lost Francois Beauchemin for the season in November). It’s so difficult to find a young, puck-moving defenseman with that size and that ability. When a chance comes to get one, you have to do what you have to do." He said what? -- The TV in the Ottawa Senators training room was on. Antoine Vermette was getting a pre-practice massage when ... everything went quiet. "I was on the training table and was hearing my name," Vermette explained. "When the room got quiet, I asked, 'Did I hear him say I just got traded?' "
Columbus' pursuit of a center to enhance the skills of Rick Nash seems to take on a different life each year. Names come and go next to Nash. And, while no one is saying that will be Vermette's role, based on past history, he'll get a whirl between Nash and Kristian Huselius at some point. Said Blue Jackets GM Scott Howson, "With the emergence of Steve Mason in goal, we felt we could trade Pascal Leclaire and address a weakness in the middle of the ice. We feel we can put Antoine in a position where he can show off his many skills in the faceoff circle as a checker and with some offensive players." A spring Jacket for Nash? Stay tuned. Showing faith -- A few days before the deadline, Florida Panthers coach Peter DeBoer was talking about his power play -- and by extension players like defenseman Jay Bouwmeester, who is a key part of the man-advantage situations. Said DeBoer, "We're not sitting there just crossing our fingers and rubbing a Buddha hoping it gets fixed." But Panthers GM Jacques Martin took the potential trade scenarios with Bouwmeester onto the gridiron, saying, "We're getting more and more like football, where the team you've built in the offseason is the team that carries you through the season, especially if you don't want to ruin the chemistry and you're in a playoff run." No trade of Bouwmeester, the potential free-agent-to-be, shows faith, plus Martin's football mentality, eh? Stopping in Detroit -- As in puckstopping and the million questions Red Wings GM Ken Holland has had to face regarding the inconsistency in his goaltending tandem of Chris Osgood and Ty Conklin. The night before the deadline, Holland was watching Osgood pitch a 5-0 shutout in St. Louis and got a little testy when someone asked him about a potential trade in net, saying, "Absolutely not, is that clear enough? I believe Ozzie's gonna play the way he can down the stretch. I like our one-two punch in goal. If we play good team defense, our goaltending is every bit as good as we need it to be." It was the second straight solid start for Osgood after getting a 10-day tutorial to retool his skills -- that coming after a stretch in which Chris yielded fewer than three goals in a game only once in 10 games. Not throwing in the towel -- Anaheim defenseman Chris Pronger had this to say about rumors he was about to be traded to Boston or Philadelphia or St. Louis, "People start trying to read too much into it and throw out a lot of names. Like a wet towel; throw it against the wall and see if it sticks." Maddening math -- Toronto GM Brian Burke knows the playing field, but he's understandably worried about the economic playing field in 2010-11 and beyond with the way teams spend in the NHL. "Any mathematician will tell you that we're all crazy," Burke explained. "Collective pronoun. We're all nuts -- because there are 30 teams and there is one parade. After the first round, there are only eight teams playing. So after the first round, you get 22 teams on the sidelines. The math is horrible. "The notion that you're going to add to your team and hope you win a round, the math defies that. But the human element is, first off, there's that optimism we all share, that belief we're missing that one piece. Second, your team expects it. Your players are looking to you to add weapons for this last part of the race. So we all get sucked in." And while some GMs do make decisions that help them win in the short term, Burke says of deadline day, "It's an awful day, it's an exciting day, it's a day full of magic, and a day full of very poor decision making." Things that make you go hmmmmm -- There are only two active NHL players who have appeared in at least 750 regular-season games, but fewer than 10 playoff games, and both individuals were traded by Phoenix at the deadline. Olli Jokinen holds the all-time NHL record for most career regular-season games (780) by a player who has never appeared in the playoffs. Derek Morris played in 775 regular-season games and only seven games in the playoffs with Calgary in 2003. ... Bet you didn't know that Mark Recchi, who ranks sixth among active players with 535 career goals, is only the second player ever acquired by Boston who had already scored at least 500 goals at the time he joined the team. The first was Dave Andreychuk, who was signed as a free agent in July 1999 with 532 goals on his resume. ... On seeing the Red Wings lose 8-0 in Nashville on Feb. 28, former Detroit defenseman Larry Murphy recalled, "When I was in Pittsburgh, we lost 8-0 one night (at home to Washington on October 29, 1991) and still won the Stanley Cup that year. We also had another lopsided loss at the end of the season (7-1 at Madison Square Garden in the final game of the season) and still won." ... Here's a weird streak. Chris Kunitz extended his point streak to five games -- matching his career high -- the first two games coming with Anaheim and the next three with Pittsburgh. All were winning games for Kunitz. ... The 23 goals the Nashville Predators scored in a four-game winning streak? Oddly, that's the same total the Preds had scored in the 12 games immediately prior to this homestand. ... Ilya Kovalchuk's 2 goals and 3 assists against Carolina on Feb. 28 was the fourth five-point game for the Thrashers big scorer in his seven seasons in the NHL, tying him with Daniel Alfredsson, Patrik Elias and Marc Savard for the most games with five or more points over that span. ... Johnny on the spot? Chicago's Jonathan Toews recorded his first career hat recently. The only player ever to notch a hat trick for the Blackhawks at a younger age than Toews (who was 20 years, 304 days old) was Jeremy Roenick, who scored three goals versus Toronto at age 19 on December 23, 1989. ... Note to coaches Mike Babcock, Andy Murray, Joel Quenneville and Peter DeBoer as Detroit faces St. Louis in Stockholm, Sweden, and the Chicago takes on Florida in Helsinki, Finland, to start the 2009-10 season. The four coaches for teams that began this season playing in Europe -- Tampa Bay's Barry Melrose, Ottawa's Craig Hartsburg, Pittsburgh's Michel Therrien and the Rangers' Tom Renney -- all received their pink slips.